Amid the widening diplomatic rift between Qatar and its neighbors, the majority of over 250,000 Filipinos in the gulf state are deciding to stay. That was according to Overseas Workers Welfare Administration (OWWA) administrator Hans Leo Cacdac in a statement given last Saturday. Cacdac said the situation in Qatar remains normal, noting that the OWWA is constantly in touch with Filipinos workers. “We are constantly observing the situation, along with DOLE (Department of Labor and Employment) and DFA (Department of Foreign Affairs). 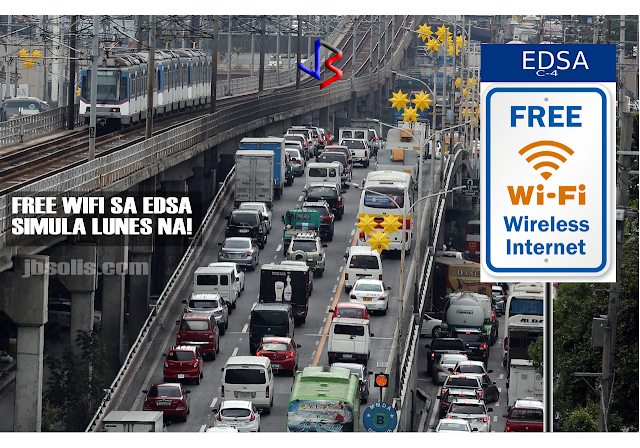 And the directive of Secretary Bello is to always be in touch with the Filipino community through direct communications or via social media or by whatever means,” Cacdac said. “Based on our conversations and information gathering, the situation is so far normalizing, not as tension-filled compared to the day when the news broke out. But nevertheless, we are not letting our guard down. We know the situation is serious, although there is a chance that this will be resolved, we will not let go until things are resolved,” he added. On June 5, Saudi Arabia, Egypt, the United Arab Emirates and Bahrain announced the severance of diplomatic ties with Qatar, over allegations that it is supporting terrorism. The initial shock of the announcement sent many residents swarming grocery stores in hopes of stockpiling food. Many food delivery trucks, construction supplies and other imported goods remain idle along the Saudi-Qatari border due to the closure by Saudi Arabia - the only country sharing a land border with Qatar. Trucks remain idle in Saudi-Qatar border. See the long line of trucks by the roadside. Qatar's debt-rating was downgraded by one notch from AA to AA- as the Qatari riyal fell to an 11-year low. Qatar's stocks market plunged 7.3% to their lowest level in more than a year and has plummeted 9.7%in the past 3 days. The long term risk to residents is of course food security. Nearly 80% of Qatar's food requirements come from Gulf Arab neighbors, with only 1% being produced domestically. 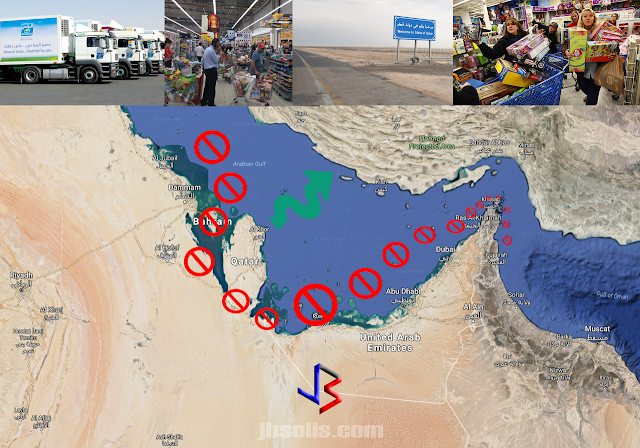 Even imports from outside the Gulf states usually crossing the now closed land border with Saudi Arabia. But the Qatari Government is not worried and they are allaying the public fears about food shortage citing plentiful stocks as well as pledges from Turkey and Iran to ship food and water supplies. 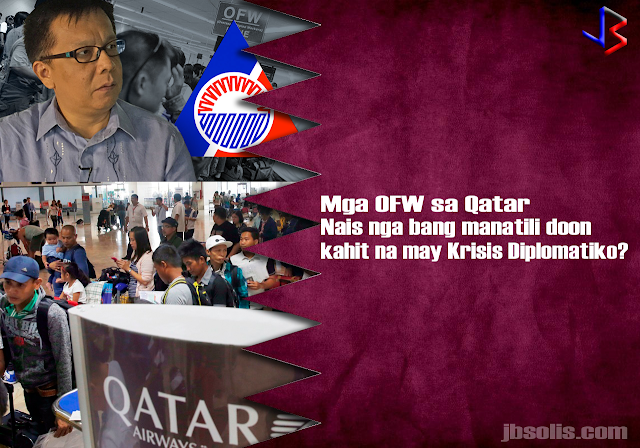 Labor Secretary Bello suspended the deployment of OFWs to Qatar following news on the diplomatic crisis. The next day, the Labor secretary partially lifted the ban, allowing returning OFWs to Qatar but stopping newly-hired Filipinos from leaving. Meanwhile, Cacdac said that the lifting of moratorium on the deployment of OFWs depends on the situation in Qatar. “Well of course the decision is with the Labor Secretary, but the basis, as far as I know, is to assure the welfare of OFWs, which means its also related to the improvement of the situation,” he said. 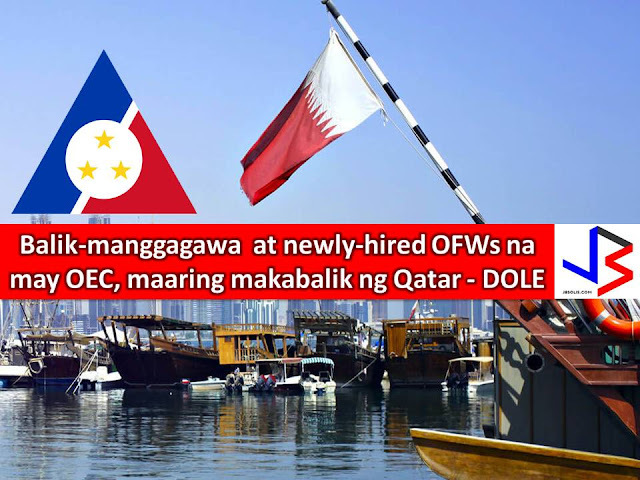 He added that OFWs who were not able to leave for Qatar should not worry because DOLE has its “Assist WELL program.” The Assist WELL program provides comprehensive welfare, employment, legal, and livelihood assistance to OFWs.